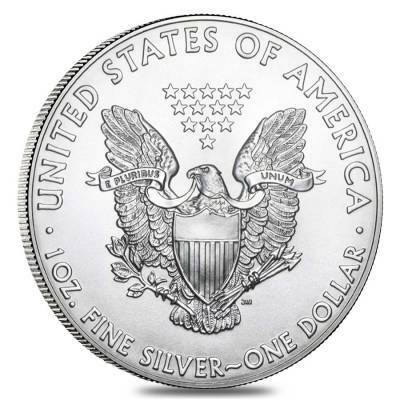 Silver American Eagles are the official investment-grade bullion coins of the United States. These coins are produced by the U.S. Mint and are backed by the government of the United States. For the 2001 edition, the U.S. Mint produced a mintage of 9,001,711 coins. American Silver Eagles are internationally recognized for their silver content, weight, and purity along with the timeless and iconic design. These coins are only released in a one-ounce size and are composed of .999 fine silver. Bullion Exchanges brings this coin to you in brilliant uncirculated condition. 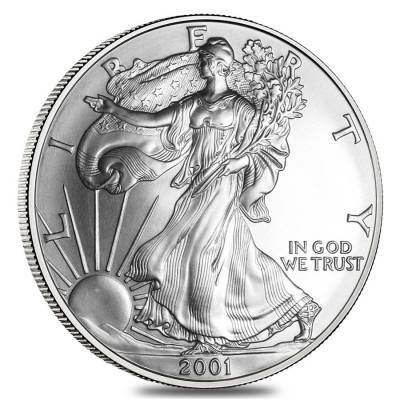 The obverse features the Walking Liberty which an iconic design that first appeared on the Silver Half Dollars released in 1916. The design was created by the renowned student of Augustus Saint-Gaudens, Adolph A. Weinman. 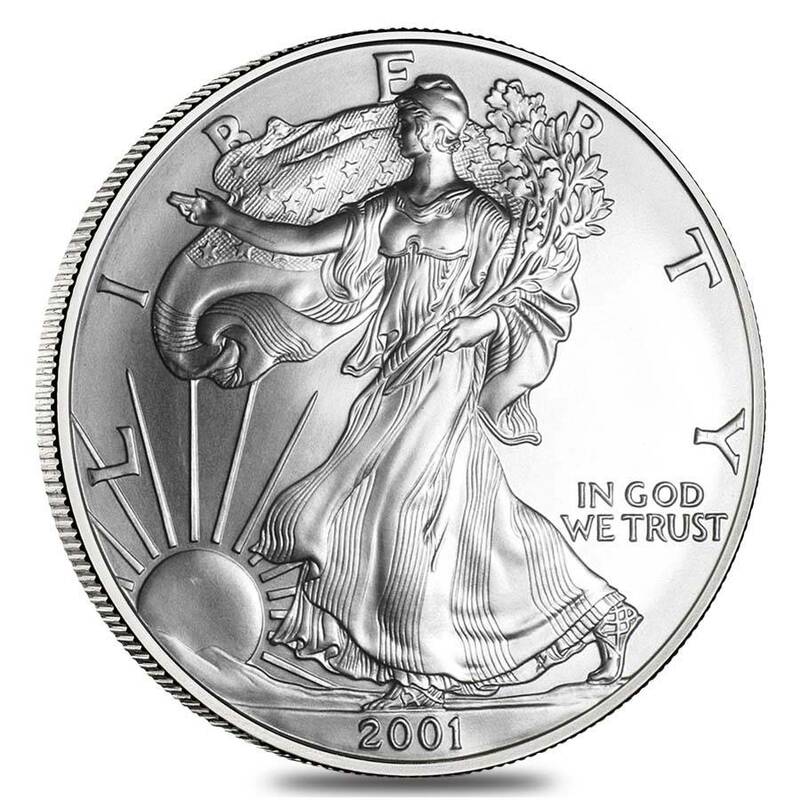 Weinman’s works were featured on the Walking Liberty Half Dollars. The artistic appeal of the design is exceptional. The reverse displays the Heraldic eagle designed by the American engraver John Mercanti. Obverse: Features a full-length image of Lady Liberty walking with outstretched hands towards the rising sun with her gown and the draped flag billowing around her. She is holding olive and oak branches in one hand to symbolize peace and strength. Inscriptions - "IN GOD WE TRUST," "LIBERTY," and the year of mintage. Designed by Adolph A. Weinman. Bullion Exchanges is proud to carry the 2001 1 oz Silver American Eagle along with many popular coins from the U.S. Mint. Add these beautiful coins to your collection today, and it will be carefully wrapped, packaged, and delivered to your address. If you have any questions, send us a message through our website or email us at customerservice@bullionexchanges.com and we will be happy to assist you. I love how easy it is to order with Bullion Exchanges' friendly customer service! Not only did my item come securely packaged but in just three days! BE knows how to handle the bullion business! 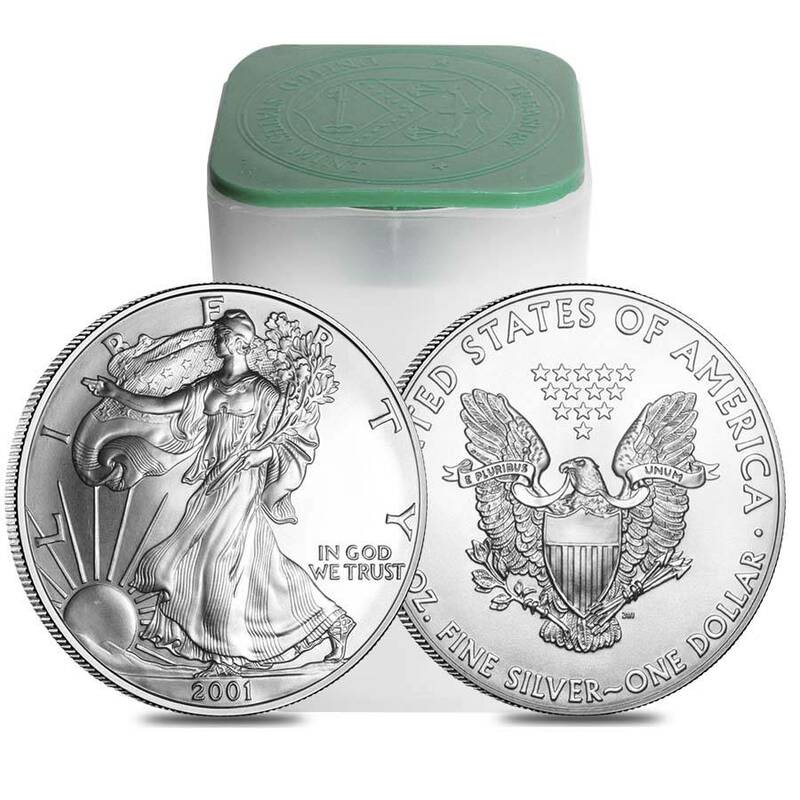 Love the Silver American Eagles and to get a roll of 20 from the year 2001 is great. Bullion Exchanges offered a very low price compared to their competitors like JM Bullion. I got my purchase in three days and in great packaging. Thanks BE!!! For every $1 spend, you will earn 1 Bullionaire Buck which is equivalent to $0.001 off a future purchase. 399 BB = $0.40.